Our farmers work each and every day with love for nature and for animals. It’s no wonder that they choose to work with a cheesemaker who thinks exactly the same way. Because the best organic milk should only go to a cheesemaker who will use it to make the best organic cheese. 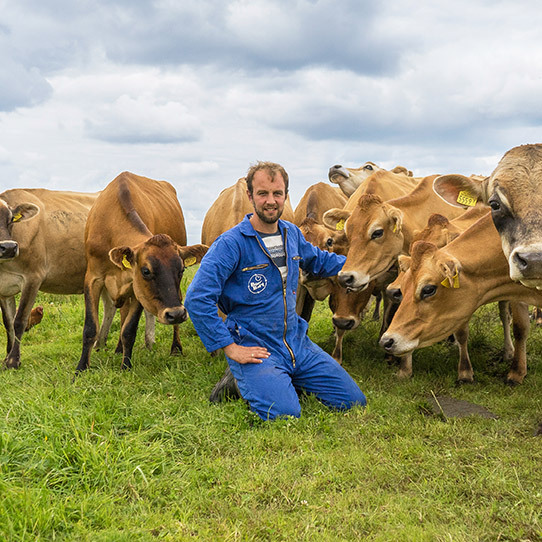 Fifty organic or biodynamic (Demeter) farmers work together for Bastiaansen Bio in an honest and transparant way. The decision to farm organically suits our way of thinking as well as the surroundings and location of our farm. Our farm is situated in a peat meadow area, which brings with it limitations and challenges, but also offers opportunities. To us, being a good farmer is a combination of several factors. It all starts with good animal health; a healthy cow gives healthy milk and contributes to a healthily managed farm. To achieve this the whole process needs to be done right. from breeding and raising calves to dairy cattle and from land use to silaging. How we optimise and combine these factors is always a good challenge. That’s a difficult choice… Basil-garlic cheese has a distinct flavour which goes really well with a glass of beer or wine. But my favourite cheese to put in a sandwich is our organic herb cheese, it’s simply a good cheese with that bit more character! On our farm we have a nice couple of black and red Holstein Frisian cows. As we have for some time extensively farmed using a lot of grass/silage as feed (no maize), we’ve always gone for a specific group of bulls for breeding. These always provide offspring with a bit more “body” and not necessarily the highest production. We haven’t got the largest cattle, but we do have cows that thrive in our farm’s environment. We really like the Holstein Frisian breed, and it offers a lot of possibilities with regards to breeding, we also enjoy all the different characters of our cows. We try to make production on our farm as sustainable as possible. We do this by feeding our cattle as much home-grown grass as possible. 90% of what our cows eat comes from our own land. Our farm has been organic for the last 25 years and our entire farm is free from the use of antibiotics. The wide variety of wild plants in our pastures adds to the health of both our livestock and our land, this means our cattle stay healthy. Our favourite is the Bastiaansen blue cheese. It’s delicious on crackers or crunchy bread, but also in salad or as part of a cheeseboard. It’s a blue cheese with a bit of a kick and that makes it really tasty! We’re really happy with the room the cooperative gives us to take part in certain milk initiatives which make our way of farming more sustainable and add value to our milk. We are also strong believers in the added value of being part of a cooperative. There is strength in numbers! We place a high value on natural sustainability. We try to work with nature as much as possible, by taking advantage of nature’s own rhythms whenever we can. Healthy, happy animals. When our cattle are happy and content it makes everything work better. They’re calm and can enjoy being outside in the sun, eating their delicious feed. That’s what makes our milk so good. 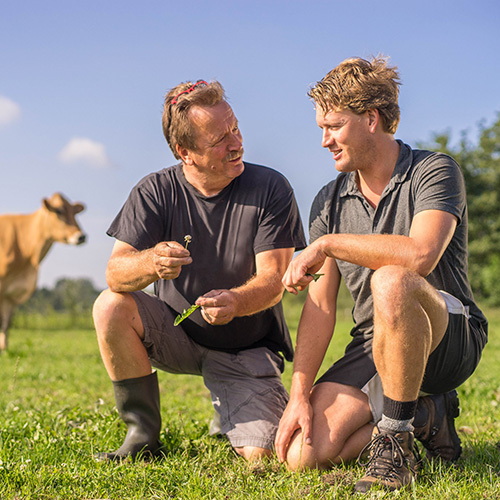 Because we know that they always adhere to strict quality standards, and also because we know that all the farmers associated with Rouveen work with passion and craftsmanship to have healthy cattle who produce high-quality milk. But if I have to pin myself down to one kind of cheese it would be old cheese like the Gold, that’s my favourite. Our cows graze on the grass land and leave plenty of manure behind. Then the chickens forage for the insects which are attracted to the manure. As they do so they root up old plants, allowing new plants the room to grow and completing the growing cycle. This reflects our vision, which is “creating a farm which can exist for 1,000 years”. This is only possible if we make optimal use of the strengths of nature itself and implement good agricultural practices. Our farmers work each and every day with love for nature and for animals. It’s no wonder that they choose to work with a cheesemaker who thinks exactly the same way. We are proud of our cooperative!